Sunday morning I decided to make myself something a little more interesting for breakfast than the usual cereal or peanut butter and banana on toast. So I decided to be adventurous and make French toast! 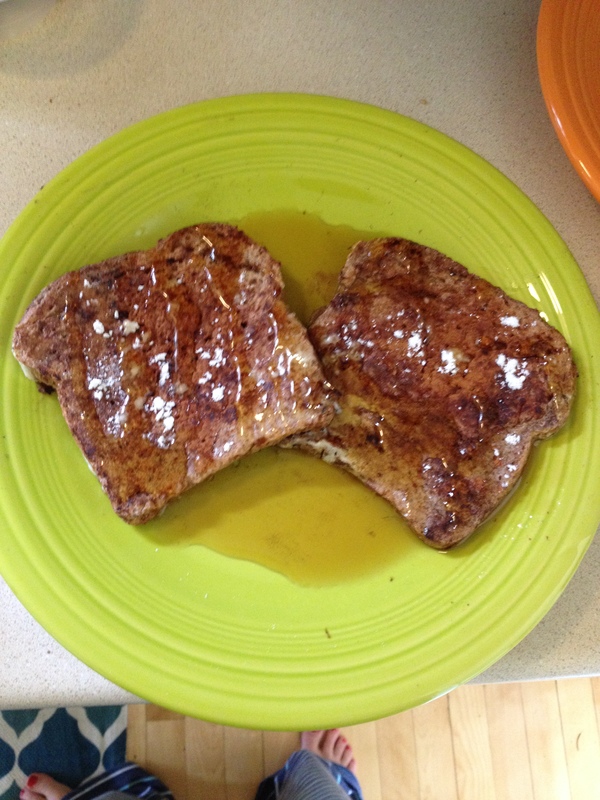 However, I will admit that I have never made French toast myself (it was something my mom always made for us as kids). I did a search for “healthy French toast recipes” and tried this one – it tasted delicious and was much healthier than the traditional version. Win win! 1.) In a small bowl, whisk together the egg whites, vanilla and nutmeg. Dip the bread into the egg mixture, coating both sides. 2.) Place a nonstick frying pan over medium heat. Spray with a little cooking spray or olive oil, then add the bread. Sprinkle with cinnamon. Cook until both sides are golden brown, about 4 to 5 minutes on each side. 3.) Top each slice of toast with powdered sugar and maple syrup. Enjoy!